SEOUL, Feb. 14 (Yonhap) -- Kakao Corp., the operator of South Korea's top mobile messenger KakaoTalk, said Thursday that its operating income plunged 56 percent on-year in 2018 despite record-high annual sales, mainly due to increased costs. Operating income reached 72.9 billion won (US$64.8 million) last year on a consolidated basis, down from 165.4 billion won, the company said in a press release. Sales, however, rose 23 percent on-year to a yearly high of 2.42 trillion won, the company said. Kakao said its operating income plunged due to more investments in new businesses as the company seeks future growth engines, coupled with increased marketing costs. For the fourth quarter of last year, the company's operating income stood at 4.3 billion won with sales at 673.1 billion won, officials said. Kakao said the revenue from its content platform remained steady at 314.4 billion won during the October-December period, with the figure representing an 18 percent on-year increase. The advertising sector's sales grew 10 percent on-year to 167.1 billion won over the cited period on the back of revenue growth of its mobile advertising. Music content sales also expanded by 13 percent on-year to 130 billion won in the fourth quarter due to steady revenues from its streaming service, Melon. Revenues from other businesses, including online commerce, jumped 48 percent on-year to 177 billion won during the same period. 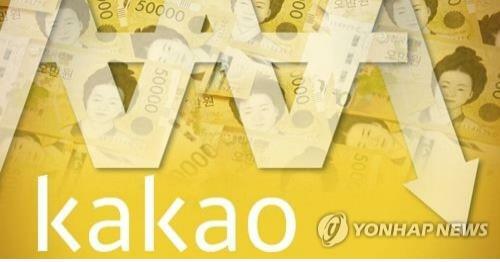 Kakao said its business expenses came to 668.8 billion won during the fourth quarter, up 31 percent from a year earlier. Kakao said it will keep up efforts by adopting a new advertisement platform based on its artificial intelligence (AI) technology. "We plan to adopt the new advertisement model in the second quarter," CEO Yeo Min-soo said. "We aim to expand revenues from advertisement by more than 20 percent this year."